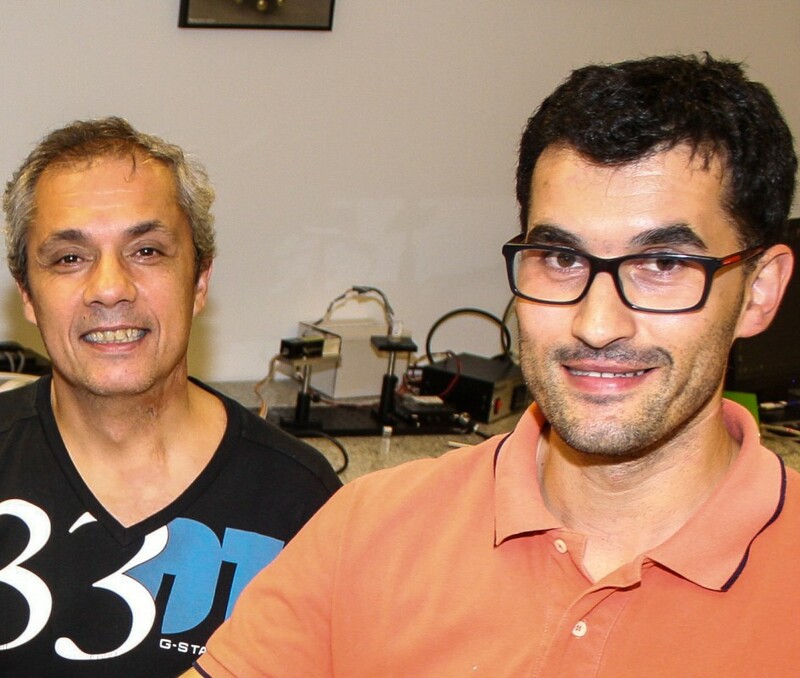 The researchers Carlos Brites and Luís Carlos, in collaboration with two Argentine research groups, have developed a new technique to measure thermal conductivity of porous nanostructures using real-time luminescence thermometry. The work, which was published in the journal Nanoletters, one of the most influential journals in the world in nanotechnologies, opens the door for the development of new thermal and electrical insulation systems, microfluidics, photovoltaic cells and catalysts, among other applications. The work reports the thermal conductivity measurement of nanostructures in layers build with gold nanoparticles of about 5 to 50 nm in diameter, on which is deposited a coating of silicon oxide or nanoporous titanium, with a thickness between 100 and 200 nm . When the gold particles are beamed with an infrared laser (980 nm) they absorb energy from the beam, releasing heat and heating the structure. On the surface of the nanoporous coating was deposited a luminescent thermometer consisting on molecules that, when illuminated in the spectral region of the ultraviolet, emit light with an intensity that varies directly with the temperature. The thermometer-heater assembly was used to measure, in real time, the heat flux through the silica and titania mesoporous nanolayers and its corresponding thermal conductivity. The values obtained match with the values measured by conventional electrical methods, which are usually destructive, requiring the deposition of additional metallic layers and insulators on the films and requiring the prior knowledge of the thermal contact resistance between the nanoheaters and the mesoporous layer. The technique now reported has none of these limitations. The synergy between the research areas of the Portuguese and Argentinean groups was fundamental to develop this new thermal conductivity measurement. The experience of the Portuguese group in nanotermometry by luminescence of trivalent lanthanide ions, combined with the nanoporous structures engineering carried out by the Argentinean researchers allowed the contactless measurement of temperature in nanostructures, an advance with impact in the characterization of the heat flow in nanometric devices. Quantification of thermal fluxes occurring at micro and nanometric scales is a very important research topic in fields requiring a high level of integration, such as electronics, biomedicine and nanoengineering. 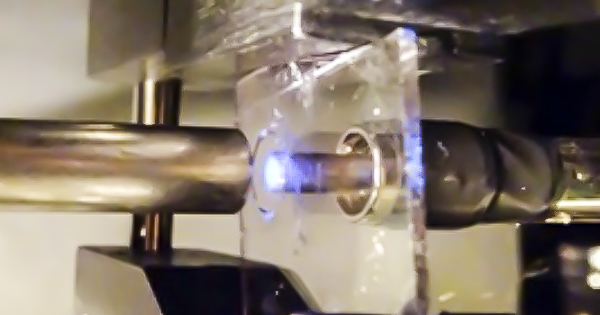 For example, the now proposed technique allows heating, in a very controlled manner, a particular region of a small chip circuit where small amounts of fluids can be circulated by using an external infrared laser. It is a simple and direct approach to control microfluidic devices, which are vitally important in the manufacture of biosensors, in the separation or production of molecular chains, or even in the creation of artificial organs. The work, which is available on the American Chemical Society's website, is a collaboration between the researchers Carlos Brites and Luís Carlos of the University of Aveiro (CICECO-Aveiro Institute of Materials and Department of Physics), and the Argentine researchers Galo Soler-Illia , of the Instituto de Nanosistemas da Universidad Nacional de San Martín, Paula Angelomé, Cecilia Fuertes and Eduardo Martínez, Consejo Nacional de Investigaciones Científicas y Técnicas (CONICET) and Comisión de Energía Atómica (CNEA).